Be the first to share your favorite memory, photo or story of Vivian B. . This memorial page is dedicated for family, friends and future generations to celebrate the life of their loved one. 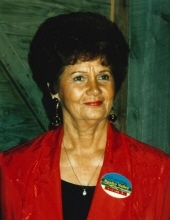 Vivian B. Cummins Kirby Pennington, 90, of Berea, Kentucky and formerly of Crab Orchard, Kentucky. passed away Monday, March 25th, 2019 at Heritage Springs Nursing Home in West Chester, Ohio. She was the widow of Floyd Kirby and Glenn Pennington. Vivian was born in Crab Orchard, KY on February 4, 1929, a daughter of the late Eva F.(Smith) and Esmer S. Cummins. She was a member of the Bethel Church of Christ. She owned and operated Kirby's Dollar Store in Crab Orchard for many years. She was a former employee of Renfro Valley. To send flowers or a remembrance gift to the family of Vivian B. Cummins Kirby Pennington, please visit our Tribute Store. "Email Address" would like to share the life celebration of Vivian B. Cummins Kirby Pennington. Click on the "link" to go to share a favorite memory or leave a condolence message for the family.